7 Things That Will Make You Visit Siberia In Winter - A World to Travel. As self-confessed nature fans, we’re always on the lookout for visiting stunning landscapes in faraway lands. 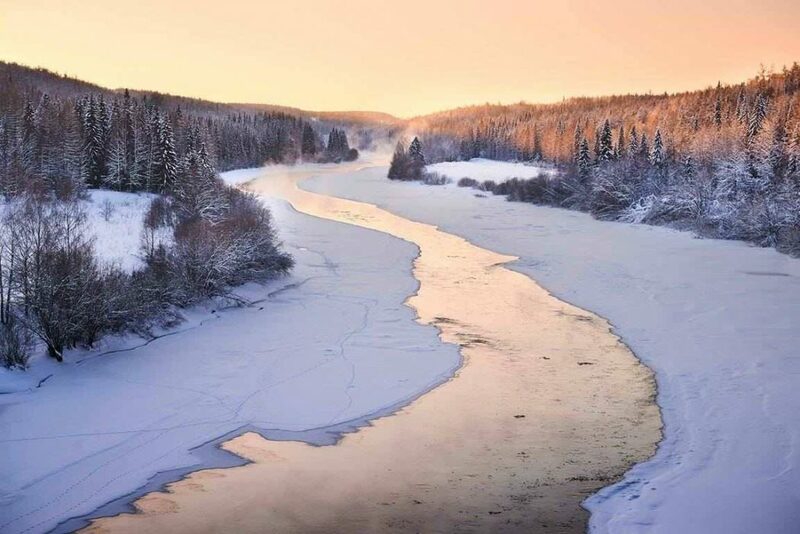 Here’s why we cannot wait to explore Siberia in Winter. 1. The mysterious Altai Mountains. 2. Legendary lake Baikal, Irkutsk Region. 6. Ergaki National Park, Krasnoyarsk Territory, Western Sayan Mountains. 7. Stolby nature reserve, next to Krasnoyarsk city. The continental climate that reigns in the coldest and wildest place on earth gives this land a variety of temperatures that can go up to 35ºC in Summer and below -50ºC in Winter. Siberia is, indeed, a land of four seasons. If in Spring everything comes to life, Summer brings up the brightest colors, and Siberian forests turn gold in Autumn, it is in the coldest season when Siberia is at its most beautiful, turning into a Winter Wonderland. Winter brings freezing cold temperatures, a washed-out color palette due to the snow falls, and also extremely eye-pleasing pastels at both sunrise and sunset. Which, by the way, are everything but rushed out, spread out for hours in the Northern parts of Siberia below the Arctic circle. A bit more North, the Polar twilight shows up. It occurs in areas that are located at the inner border of the polar circles, where the Sun will be on or below the horizon all day on the Winter solstice. And further North comes to the Arctic Zone. There’s no sunlight or even twilight since from November near the North Pole. Of course, the darkest time of the year there is the Winter Solstice around Dec, 21st. Darkness will last until the beginning of dawn around February. The Siberian territory of Russia stretches West to East from the Ural mountains to the Pacific Ocean and North to South from the Arctic Ocean to Mongolia. It represents around 10% of the earth’s land mass, what makes it HUGE! Located in the middle of Eurasia, where Siberia meets Asia, Altai is home to species we aren’t used to such as the snow leopard, falcon, and lynx. On the other hand, petroglyphs, stone engravings and other antiquities found in this region caves show how humans have lived here for a long time. The Altai mountains are nowadays a paradise for active tourism. The adventurous types can swim in rivers, climb mountains, and get lost in the forests near Lake Teletskoy among many other things. Baikal is the deepest lake on earth reaching depths of over a mile and the largest body of fresh water stretching over 400 miles. This gem, called ‘holy sea’ by many, attracts thousands of travelers and landscape photographers every year, as it is full of picture ready spots like the rocks and sand dunes at the Olkhon island. Baikal lake can be found in every Russian road trip out there. Where the isolated Nenet tribe, Russia’s last nomadic reindeer herders, lives on the edge of the Arctic Circle in the tundra. Kamchatka is the Easternmost region in Siberia and displays both incredible fauna (sea lions anyone?) and mind-blowing landscapes such as snowy volcanoes and sea caves next to the Bering Sea. It is also a snow sports haven. How does big mountain skiing along the Pacific Ring of Fire sounds? Surrounded by taiga, fast-flowing rivers, and inaccessible mountains, are the huge dunes of Chara sands, one of Siberia’s most unique places. Waterfalls, mountain tops, and reflections of sharp granite peaks in lakes can be seen in Ergaki, one of the most accessible Siberian mountainous and taiga-forest area. Very Instagram ready if you ask us! Impressive 60-90m high rocks that appeared due to volcanism and were shaped by strong winds and water erosion, Stolby’s free-climbing opportunities are acclaimed worldwide. Aka. ‘the land of 10,000 lakes and 1,000 waterfalls’, Putorana plateau is located in the Far North. There are almost no roads, so visitors usually get there by helicopter or boats during Summer and snowmobiles in Winter. How cool is that? Although not a natural gem, this iconic railway deserves a spot on its own in the list of Siberian wonders. Foreigners and native Russians all get on board the Trans-Siberian Railway to better get to know the world’s largest country as the most epic landscapes are seen right out of the train’s window during the 9298km and 7 days the journey lasts from Moscow to Beijing. It unites Europe and Asia since 1905, crossing treacherous terrains and vast territories. Stories of hospitality and vodka on board the train can be found all across the internet, but that’s a completely different story that – we guess – belongs to the adventures that should be lived before leaving this earth. Also man-made, the many wooden architecture masterpieces across Tomsk region towns are well worth a visit. There are more than 30 native nations in Siberia with their own unique and untouched culture and way of life. Although Siberia is largely inhabited, nomads and indigenous people of Siberia dominated this central Asia steppe until modern times. These days when digital nomads seem to be taking over the world, Siberia takes center stage due to the nomadic vibe it has had since prehistoric times, somewhat a magnet for the explorer-types. The Hell Hole (found in the Yamal Peninsula). Largest of the many big holes that have been found in different parts of the country like Taz district and Taymyr peninsula. Whether they are a cause of the permafrost melting due to global warming or something else, is still being discussed. Tumat Puppies (found in River Syalakh in Tumat): Mummified animal 12 thousand years old. Siberian disks (found in Kusnesk Basin): Man-made and found 40 meters below the surface in 2015, scientists are still clueless about them. Ukok Princess (found in Ukok Plateau): Remains of a 25-year-old heavily tattooed ancient woman, said to be a princess. Woolly Mammoth (found in New Siberian Islands): The best-preserved female mammal found in the history of paleontology. The unknown and unforgettable Siberian region and its 12.5 millions of km2 have been open to tourism for more than 20 years. Past and future melt in this land which is today not only a paradise for active tourism (as activities such as hiking, caving, and snowboarding don’t get much better than surrounded by the untouched nature of Siberian territories) but also home to lively and modern cities with developed infrastructures. Entrepreneurial spirit and tech hubs such as Akademgorodok (the Silicon Valley of Siberia) can be found in Novosibirsk, Oms, and Krasnoyarsk (where the Winter Universiade 2019 will take place) nowadays. But there are many other things to it. Its prominently young population is shaping this land in new ways, with its unique urban culture, startups, trends, and music festivals among others. Bring it on, Siberia! We can’t wait to know more about you! How on earth do we know if what’s been said here is true if we don’t get to go there and witness it ourselves?